There is so much to be said about Warner Bros. Television & CW and how they are dominating the DC TV universe and how they really seem to be in the zone! Zoom! Went The Strings Of My Heart. This week out on Blu-ray and DVD is Season Two of the Warner Bros. Television & CW's hit series The Flash, and all I can say is, love is in the air! It seems as if while Season One revolved more around Barry Allen and his family issues, along with his unrequited love for Iris West, this season involves a bit of the Flash gang getting it on! While it's no surprise that love stories (especially sappy ones) thrive on the CW, most of the ones in The Flash not only play an important role within each of the characters directly affected but also have an effect on the storyline and how Flash can ultimately get his job done. But first, for all those who haven't seen or heard of The Flash… Flash was a New York Jets football star who meets Dale Arden and both are shot in a rocket to Planet Mondo where they are captured by Emperor Ming! DEATH TO MING!!! Really??? That's FLASH GORDON!!! Come On!! You know who The Flash is!! Barry Allen, Speedster Extraordinaire (Hero-us Most-est), and the human version of the Road Runner! Beep Beep! Barry lost his mother to the Reverse Flash and his father was sent to prison. After being hit by lightning, Barry could move faster than any man on Earth... well that is until Zoom… but let's not go there yet. Season Two starts off directly where Season One Left off. Barry is feeling responsible for Eddie's death and is hesitant to allow anyone close for fear of losing someone else. Jay Garrick, a speedster from Earth Two, appears at S.T.A.R. Labs and fills in the gang that there are bigger problems at hand. One! The big attack at the end of Season One left major breaches and portholes around the city. And Two! A very big bad man, Zoom, is now sending villains from Earth Two to kill Barry Allen. Not good, right? Well, it gets better, because guess who shows up next? Harrison Wells! Yes, but Harrison Wells from Earth Two. Could he be a different, let's say, good guy? It's possible, but would you trust him if the first one you met killed your mom? Yea, I didn't think so! Harrison Wells is in town to get Barry Allen's help to stop Zoom who abducted his daughter and is keeping her hostage in an effort to get Wells to do as he wishes. So where is the love? Enter officer Patty Spivot who desperately wants to join Joe West's meta-human task force and well... let's speed this up… ends up flirting with Barry Allen and love is in full bloom. Yup! Barry is in love! But it never comes easy and every time there's a plan, some superhero stuff gets in the way. Really Uncle Ben? Enough with the "Great Responsibility" warning (that one line so comes into play with every hero across every universe doesn't it?)! While Barry is in love with Patty, Caitlin Snow & Jay Garrick are mad flirting to the point Cisco is telling them to get a room already. Even Cisco throws himself upon love's sword! Let's just say he finds better things to go with his coffee! Then, another door from the past opens and Francine West walks in! Yup, Joe's ex-wife, and Iris's mom, comes back to make good for being a bad, drug addicted, family-abandoning mother. But, like all things, there is more to the story! She's dying… oh, and Joe has another son! WTH right? Wally West! And who knew he was part of the Fast and the Furious! I'm guessing it was Tokyo Drift because no one remembers anyone from that movie! Oh… Zoom. See that? With all the love and drama, we totally forgot there was a big bad villain out there. Well, Zoom is a meta-human Speedster from Earth Two who is now hunting other speedsters and acquiring their speed, and, in the process, making Zoom faster and even more dangerous. You could say he is almost impossible to defeat. Could Barry Allen and Team Flash come up with a plan to defeat Zoom? Well, I'm not gonna tell you!! Your gonna need to go out there and get The Flash Season Two and find out for yourself! What I will tell you is within this set is a great crossover episode with Arrow and even Legends of Tomorrow is part of that crossover. CW & Warner Brothers Television is doing great things with all the DC properties and while Flash made an appearance in Supergirl's Season One and Arrow and Flash have been together on multiple occasions, in this season coming up, they are about to make history. For the first time, a network will make a crossover, four-part miniseries over four nights with Supergirl, Arrow, Flash and Legends of Tomorrow! Just one more reason to get this set and get caught up! The other reason can be summed up in one word. FLASHPOINT! And yes, they are going there! There is so much to be said about Warner Brothers Television & CW and how they are dominating the DC TV universe and how they really seem to be in the zone! They are constantly bringing in amazing talent from Mark Hamill who reprised his role as the Trickster, to bringing in the ultimate comic book Geeking Out fanboy Kevin Smith to direct not only an episode in this season, but now another in Season Three and an episode of Supergirl in Season Two! If you're a fan of The Flash, the bonus extras in this set are awesome! They boast that they add up to 4 hours of additional content. Bonus/deleted scenes are brilliantly displayed with each episode (instead of batched together on a bonus disc), along with behind the scenes VFX on selected episodes. There's also a gag reel (of course) and featurettes that include The Many Faces of Zoom, Chasing Flash: The Journey of Kevin Smith and The Flash:2015 Comic-Con Panel. As a big fan of what the CW and Warner Brothers Television is doing with the DC properties, I totally recommend this Blu-ray set! I love the way it's packaged together having the bonus scenes listed with each episode. I give The Flash Season Two 5 lighting bolts out of 5. It's everything a fan can want out of a TV series box set. Go out and get yours! You don't have to be as fast as the Flash to get a copy, but you may find you're binging 23 episodes in a FLASH! 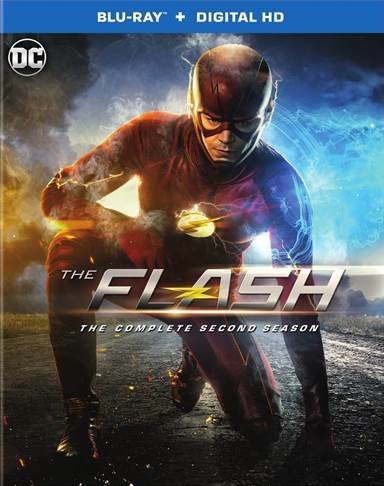 Download The Flash: The Complete Second Season from the iTunes Store in Digial HD. For more information about The Flash visit the FlickDirect Movie Database.